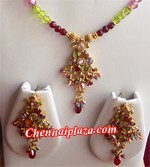 Lady's Fashion > Ladies Accessories > Fashion Jewellery. 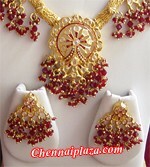 Item Description Marvellous looking 1 gm forming technique gold coated silver polki set with red stones in a lavish designer necklace and ear studs. Item Description Cute and delicate looking floral design silver set with colourful stones and gold polish, comes with ear studs and a matching ring too. Item Description Elegant looking imported red stones set in a dull gold polish finish could be a great match for any dress of yours. Item Description Splendid looking neckset having colourful beads decoration enriched by colourful stones decoration in a floral designer 1 gm golden polish base.